We just came back from a great conference week in Mainz where we exhibited at BASTA! 2010. I will post some impressions soon. Thanks to all users and interested people at our booth - we really enjoyed talking to you in person. We won't unpack the booth crates yet, because we will be on the road again soon. I would like to let you know about the next conference at which we will be exhibiting in about 3 weeks: Prio Conference in Nuremberg, Germany. 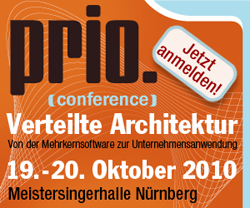 Prio Conference is another nice conference in the southern part of Germany. It is at a nice location, offers an interesting line-up of speakers and great exhibitors. So, if you are attending this event, be sure to stop by at our booth to get one of our great baseball hats and a preview demonstration of the upcoming WPF version TX Text Control .NET for WPF.